At Forever Memories we have a fantastic range of Stag night t-shirts. We can print any design or wording of your choice onto mens crew neck or v neck garments. Prices start from as little as £7.95 per t-shirt printed 1 side. We have a wide variety of different colours of print, ranging from our standard colours, metallic colours or neon colours. Choose from our library of designs or design your very own stag party t-shirts by sending us an email outlining any information to sales@forevemories.co.uk and accompany your email with any attachments or images to help our design team create your very unique personalised t-shirt. 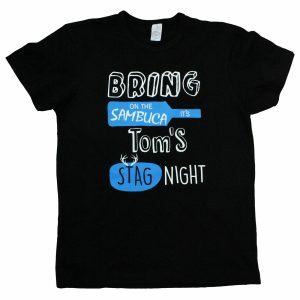 Bring on the Sambuca Stag T-shirt can be personalised with the stag’s name, you can also personalise this t-shirt with a name /nickname on the reverse. College font stag t-shirt is a American college football style themed stag t-shirt. Personalise this stag party t with your own personalisation. 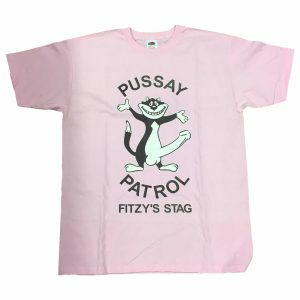 Pussay patrol stag t-shirt is based off The Inbetweeners movie. 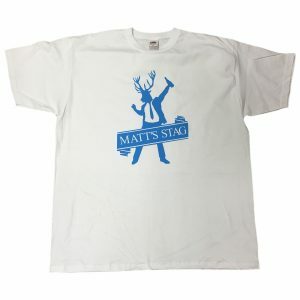 Personalise this stag party t-shirt with your own personalisation. 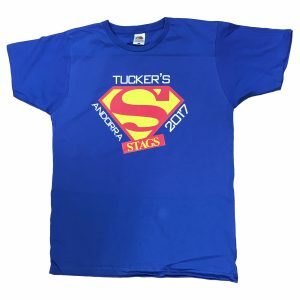 Stag Dance T-shirt can be personalised with the stag’s name, you can also personalise this t-shirt with a name /nickname on the reverse. Super Stags t-shirt available in a choice of colours. Personalise this t-shirt with a name of the Groom, destination & year on the front and you can also include a name/nickname on the reverse if required. 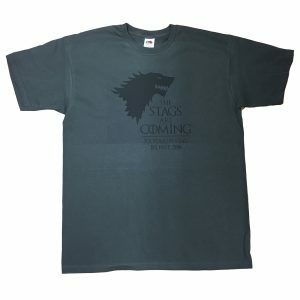 The stags are coming t-shirt is a stag themed t-shirt for the game of thrones lovers. Personalised t-shirt t-shirt with the who’s stag party it is and a venue / date. 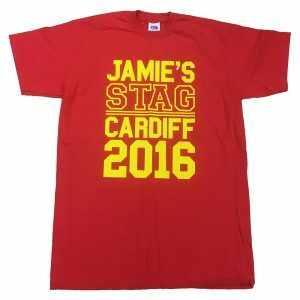 All of our stag t-shirts can be ordered online, however we appreciate it can be a long winded process ordering such items, especially for a large group. Alternatively we are more than happy for you to email us the order in whatever format preferred e.g table or a spreadsheet to sales@forevemories.co.uk. If you have any queries before emailing your order please call Amy, Lottie or Steve on 01384 878111 who will be more than happy to assist you with answering any questions you may have. *Please note we only accept orders online or by email which is to ensure all personalisation & spellings are correct.